Researchers at Rice University used computer models to demonstrate that twisting graphene alters its electrical properties, and produce what is known as a flexoelectric effect in which a material exhibits a spontaneous electrical polarization brought on by a strain. When in flat sheet form, graphene's atoms have a balanced electrical charge. Putting a curve in the graphene plane, however, makes the electron clouds of the bonds on the concave side compress while on the convex side they stretch. This changes the electric dipole moment, which is a measure of the overall polarity and determines how polarized atoms interact with external electric fields. 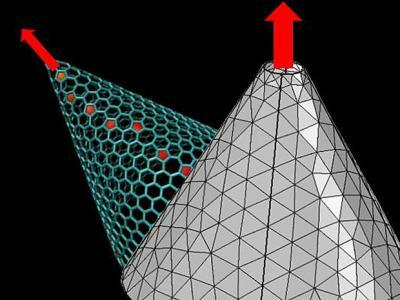 The researchers determined how each possible curvature in graphene could impact its dipole moment, thus providing a way to calculate how graphene’s electrical properties change in any given geometry. They state that while the dipole moment is zero for flat graphene, there is still a whole range of shapes with varying dipole moments that should be known in order to help with a number of engineering issues with graphene. Will Stanene become graphene's rival in terms of electrical conductivity?